Photo Caption: Day 65: Today’s piece is by Bakewell Bros from their Newtone Art Ware line circa 1930s. This piece is a rare Newtone shape and is in fact the only one I’ve seen before. The thin basket handle almost looks like it would break if you look at it too harshly which is possibly one of the reasons you don’t see this shape about. If any collectors out there have one I’d love to see it. Photo Caption: Day 64: Today’s piece is by Bakewell Bros from their Trent Art Ware line. Not a shape you see often but as is often the case, if you see one you probably see another 2 or 3 in quick succession. Like some of Bakewells other shapes this one is probably a copy of an English made piece. Bakewells sold some of their moulds off in the early 1950s and this shape is one they sold to Diana so you will more commonly see their version of this vase around the shops. Photo Caption: Day 64: Today’s piece is by Bakewell Bros from their Newtone Art Ware line circa 1930s. Quite an odd decoration but one that pops up from time to time on a number of different shapes. I don’t know if it’s the most distinguished Newtone design but it’s certainly a bit of fun. Photo Caption: Day 62: Today’s piece is another mystery Tasmanian piece. 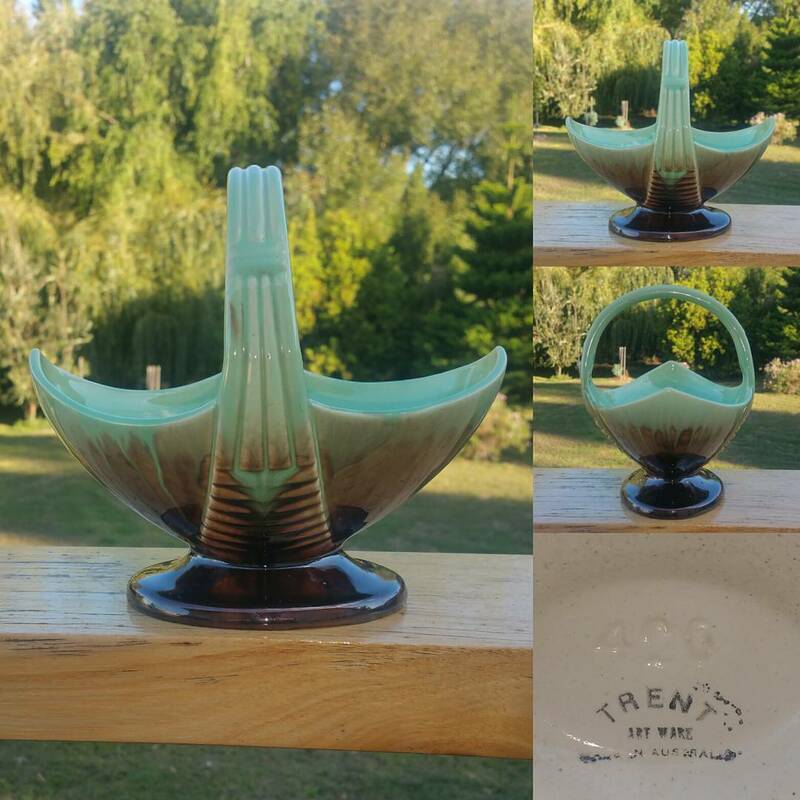 Unmarked but possibly by Van Diemen pottery circa late 1940s. 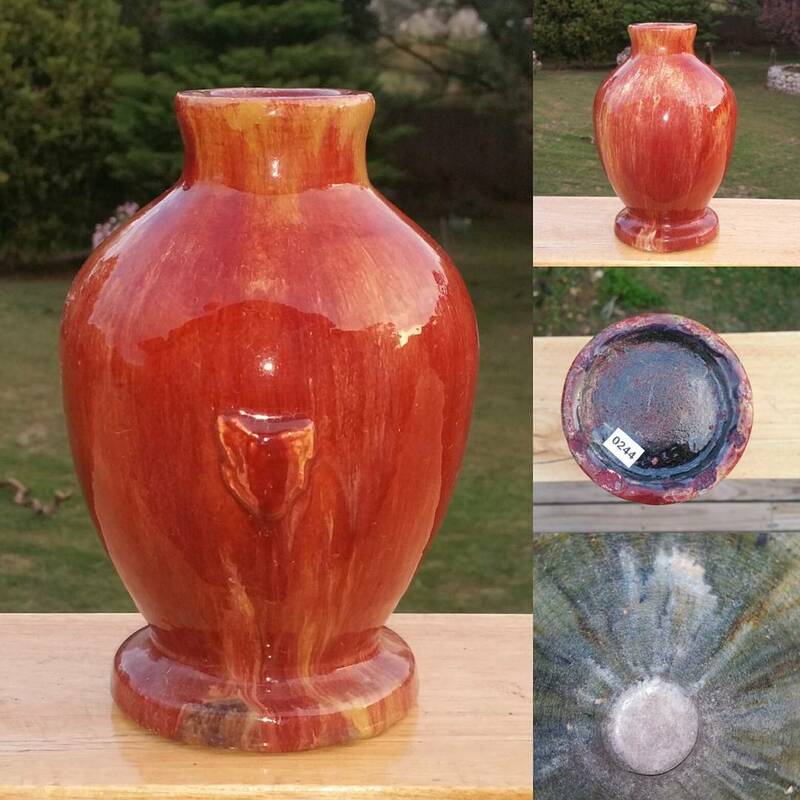 The body is covered in an amazing red and yellow drip glaze with purple covering the base. 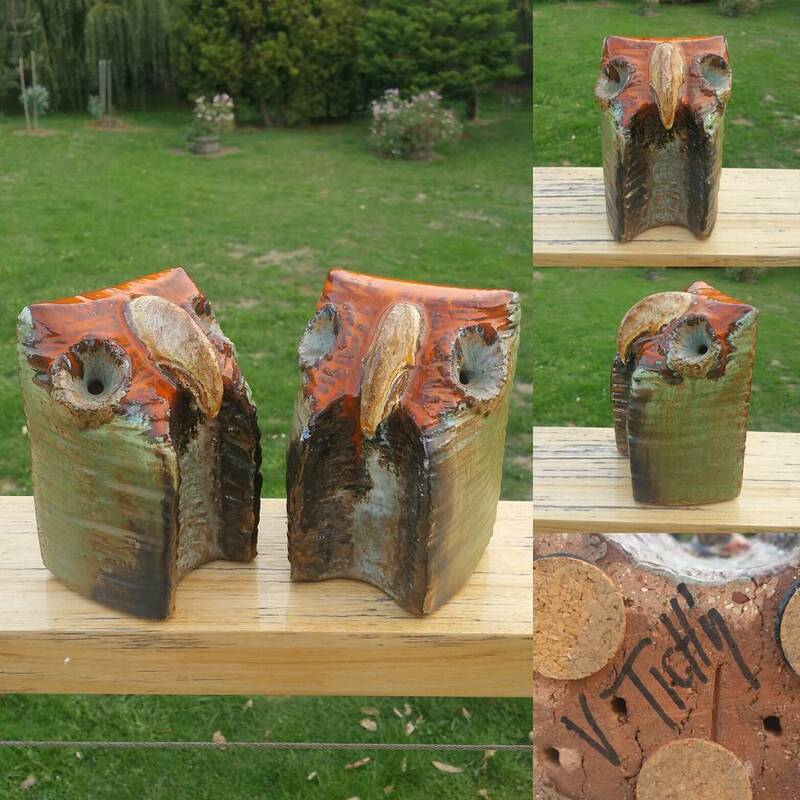 It stands about 20cm high so not a small piece. Photo Caption: Day 61: Today’s piece is a miniature jug made by NSW based pottery Koala. 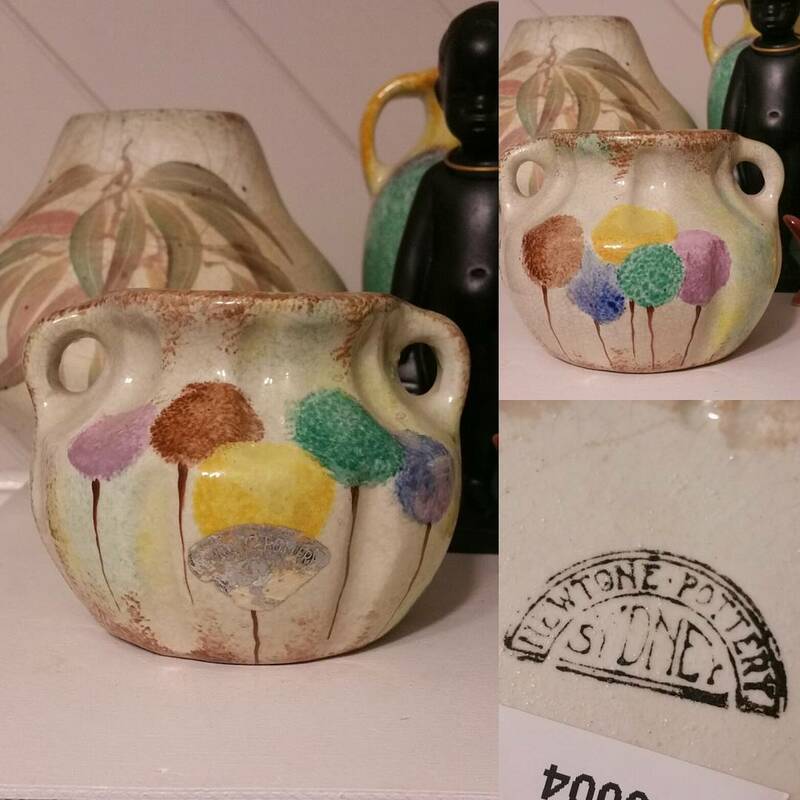 There are 2 Koala potteries listed in Geoff Fords pottery marks book. 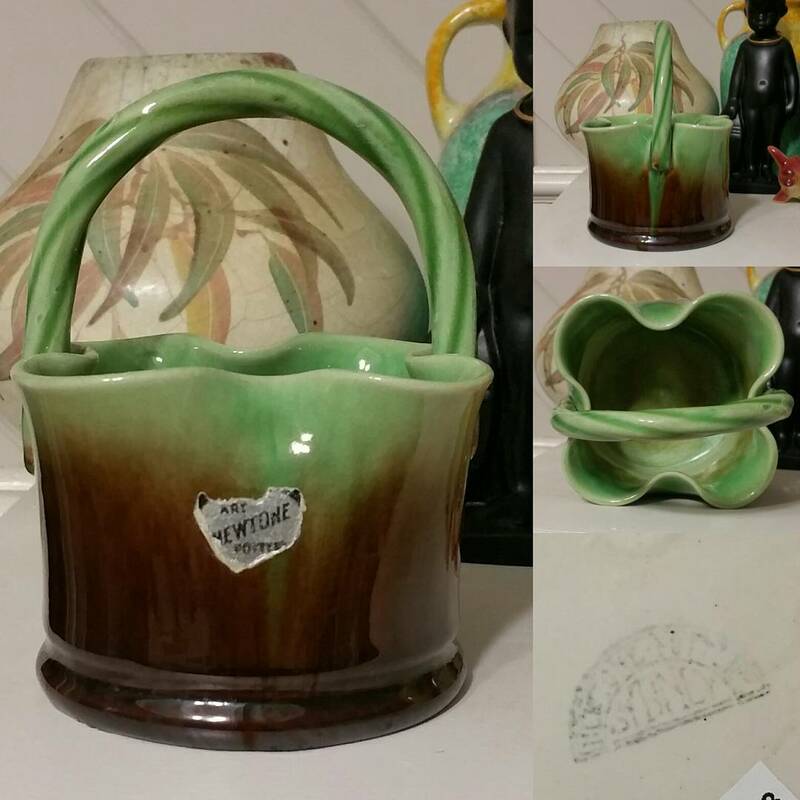 This is from the later post war pottery. 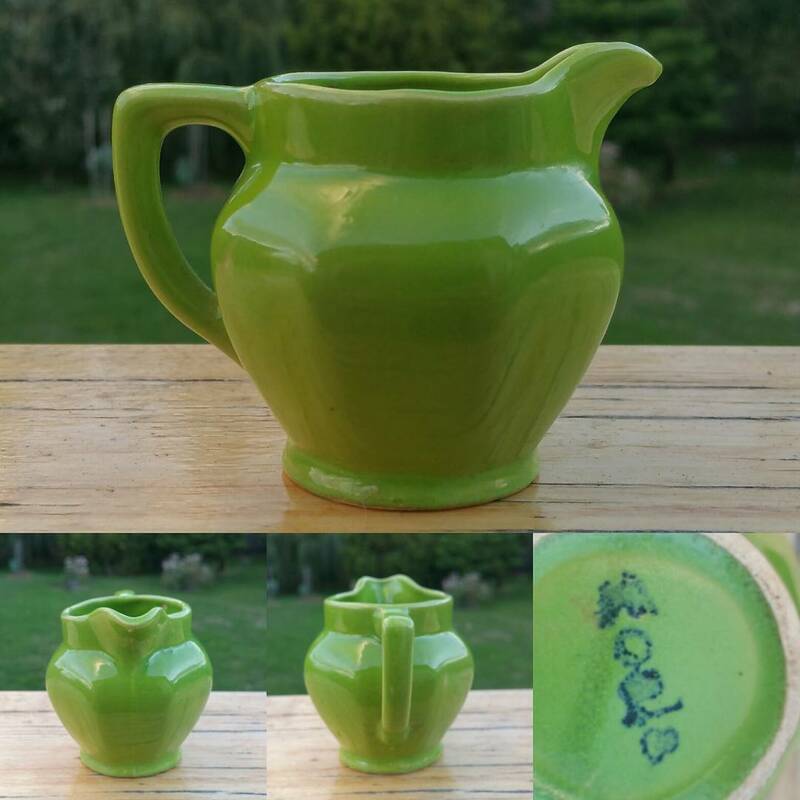 This jug is a 1950s copy of an earlier jug probably made by the Fowler pottery although the Fowler jug might have been a copy of an English jug around the early 30s. Koala always surprises me. They were only a small pottery in Oyster Bay but they seemed to have produced an interesting array of items and some absolute stand out pieces that would rival any of the best post war potteries. 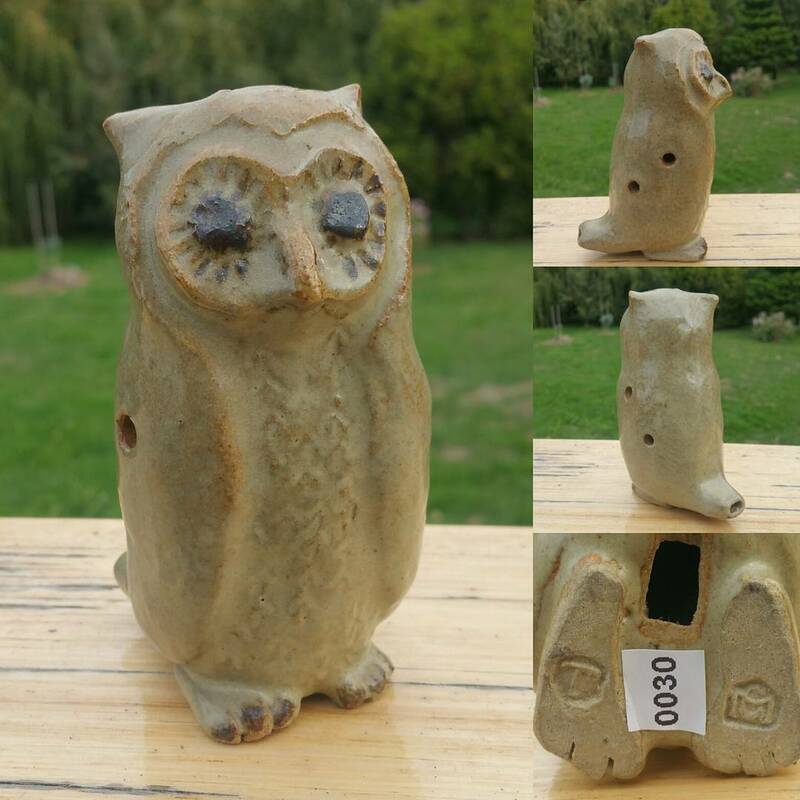 Photo Caption: Day 60: Today’s piece is another Owl. 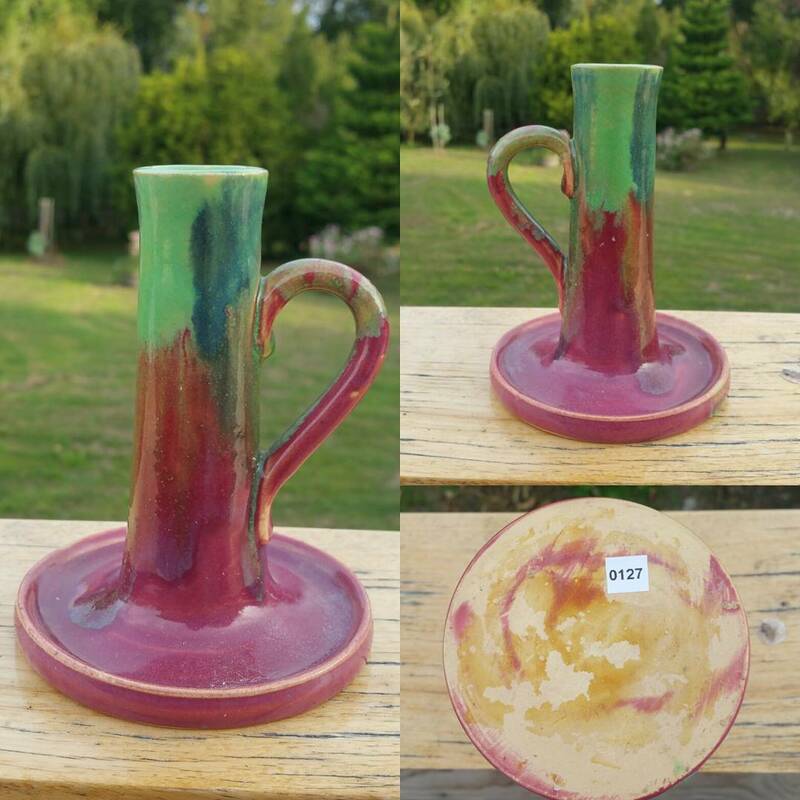 This time by my fav Tasmanian potter Cynthia Mitchell. This Owl hides a little secret which you only really notice when you turn him round. He is a whistle (or ocarina). One of 10 different whistles I have by Cynthia. I’m guessing there has to be at least one more as I don’t have a Tassie Devil which she would have had to have made! Photo Caption: Day 59: Today’s piece is by Sydney based architectural ceramic artist Vladimir Tichy circa 1973. Purchased locally a few years back now I can only guess that Tichy held an exhibition at the opening of Wrest Point casino and these and a few others I own came from that exhibition. To say these pieces are substantial is an understatement. Each is about 3/4 the size of a house brick and just as heavy. My partner spotted and purchased these at auction and I have to say she has good taste. They would have to be at the top of my favs list when it comes to the modern studio pottery we have here. Photo Caption: Day 58: Today’s piece is by Bakewell Bros from their Trent Art Ware line. 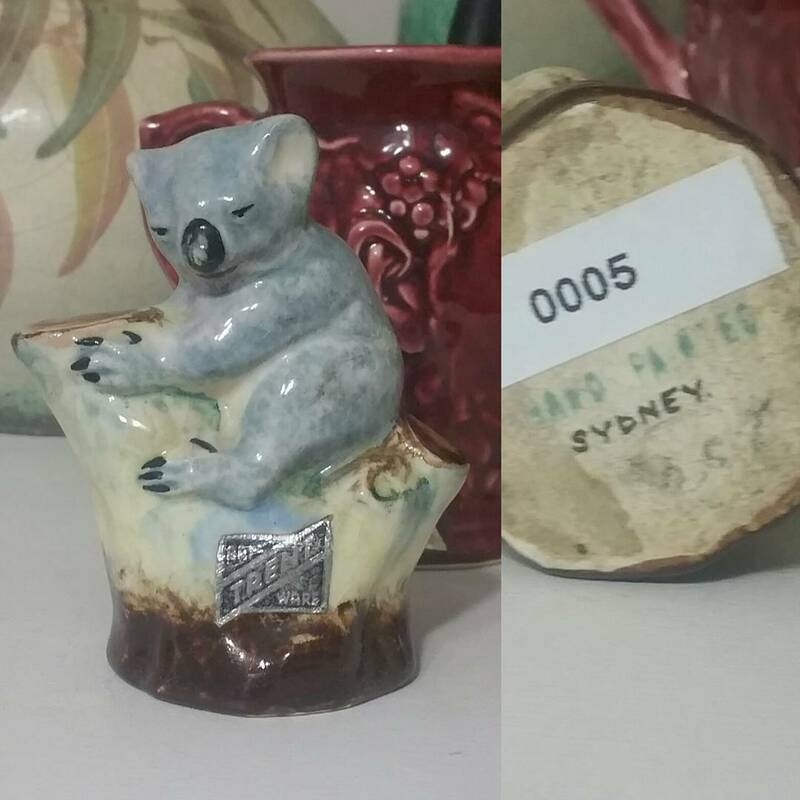 This hand painted Koala is one of a number of figural pieces produced by Bakewells, very few of which have a pattern number impressed on the base. It’s not clear to me if these animal figures sit outside the 600 or so regular pattern numbers in the Newtone/Trent line or if they just failed to number most of their figures. If you have a figural Newtone or Trent piece with a pattern number I’d love to hear from you. 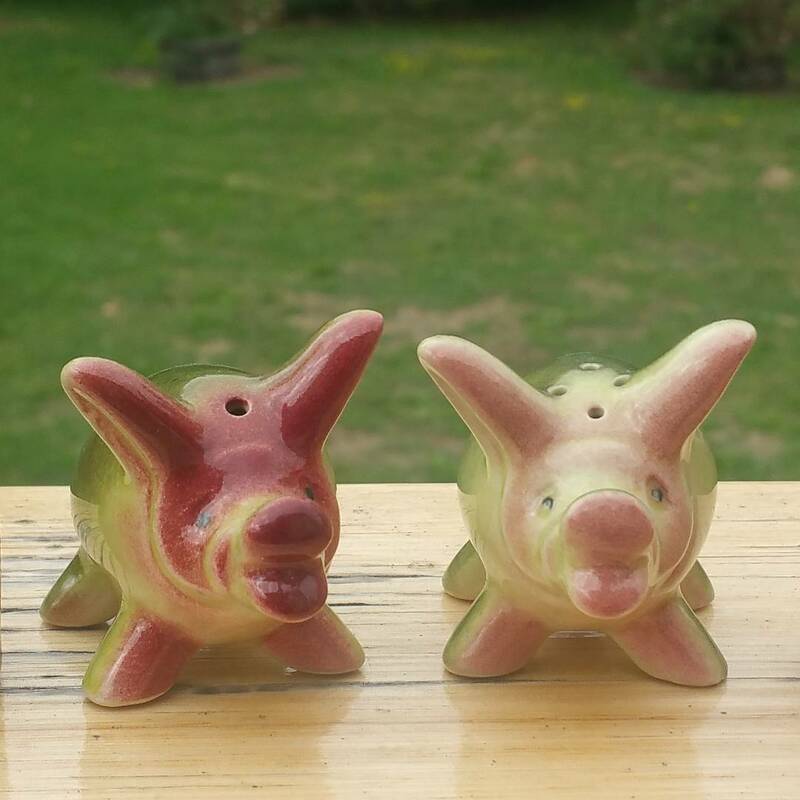 Photo Caption: Day 57: Today’s piece is a pair of Pig salt and pepper shakers by the Darbyshire Pottery at Innaloo just outside Perth Western Australia. Unmarked, except for the distinctive diamond arrangement of the holes on the pepper shaker.